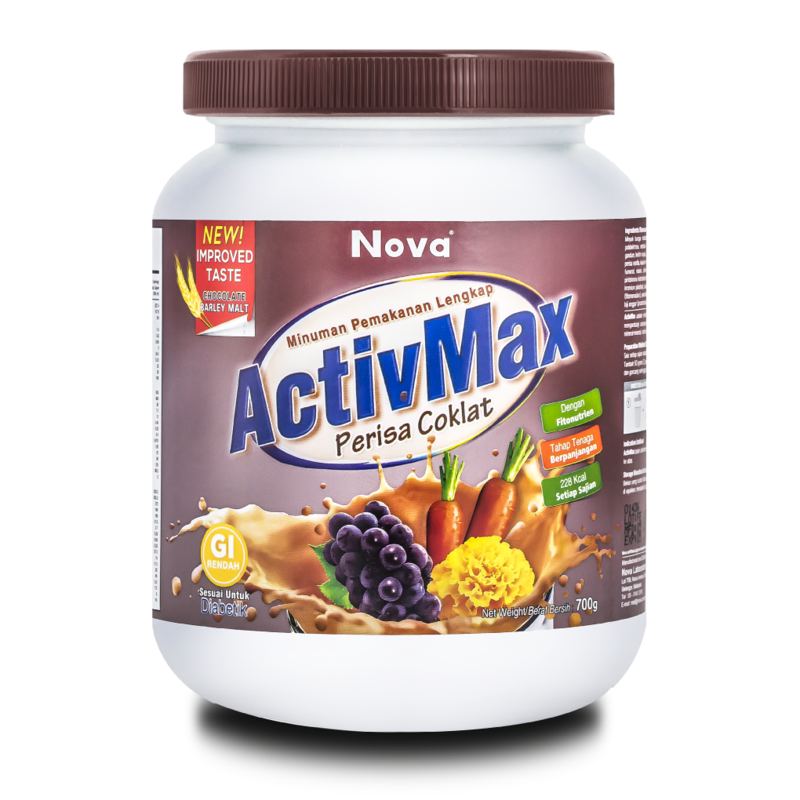 ActivMax Chocolate is a complete, balanced and low glycemic nutritional drink that provides a good blend of carbohydrates, healthy fats, quality proteins, dietary fibers (soluble and insoluble), vitamins, minerals, energy promoting nutrients, and natural plant extracts as natural antioxidants. Nova is able to consistently improve our formula, which brings you a new improved taste of chocolate and barley malt to suit the family’s taste buds. ActivMax Chocolate is specially formulated to fit the daily nutritional needs of diabetics and assist in managing their blood sugar level. 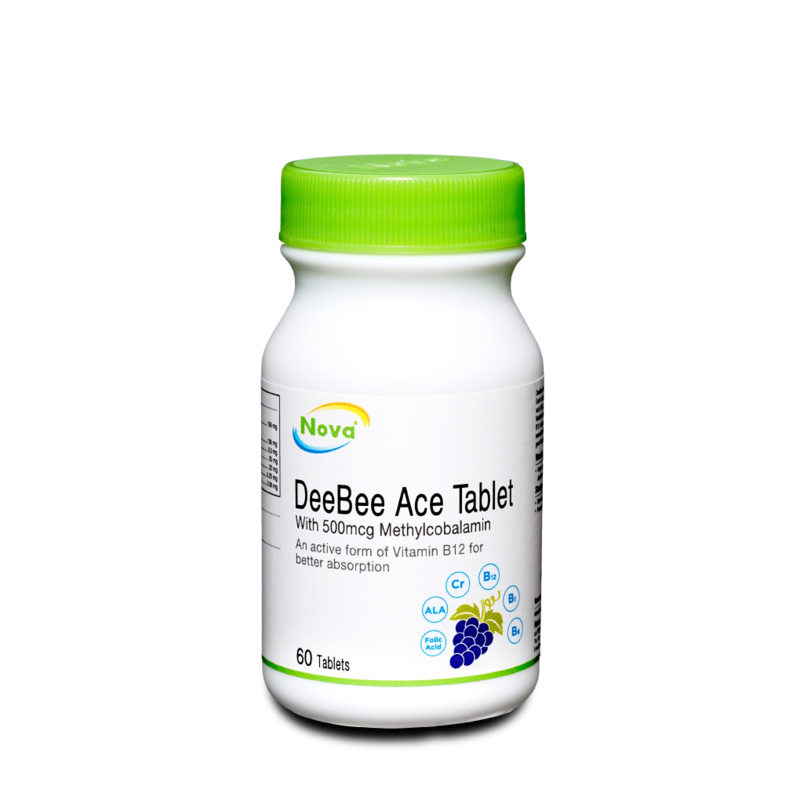 It provides energy promoting nutrients and antioxidants which includes plant nutrients, L-carnitine, coenzyme Q10, alpha lipoic acid (ALA) vitamin B1, B2, B6, and B12 which are essential for them. With its sustained-release casein, it can provide a prolonged level of amino acids to aid energy and recovery. Sunflower oil (high oleic acid), corn starch, isolated soy protein, fructose, maltitol, calcium casein, polydextrose, cocoa powder, barley extract, maltodextrin, gum arabic, isomaltulose, microcrystalline cellulose, xanthan gum, wheat fiber, soy lecithin, choline chloride, tricalcium phosphate, calcium carbonate, magnesium oxide, potassium hydrogen phosphate, vanilla flavouring, potassium chloride, sodium chloride, carnitine, inositol, vitamin C, taurine, vitamin E (D-alpha tocopherol), ferrous fumarate, niacin, zinc oxide, calcium d-pantothenate, manganese sulphate monohydrate, copper sulphate pentahydrate, vitamin B6 (pyridoxine hydrochloride), vitamin A palmitate, vitamin D3 (cholecalciferol), vitamin B2 (riboflavin sodium phosphate), vitamin B2 (riboflavin sodium phosphate), vitamin B1 (thiamine hydrochloride), chromium picolinate, folic acid, biotin, potassium iodide, sodium molybdate dihydrate, sodium selenite anhydrous, K1 (phylloquinone), vitamin B12 (cyanocobalamin), Coenzyme Q10, alpha lipoic acid, bioflavonoid (rutin), marigold extract (lutein), grape seed extract (proanthocyanidins). Add 50g (2 scoops) of ActivMax Chocolate 200ml to a glass of warm water (200ml), stir vigorously until the powder is completely mixed. Drink while it is fresh. 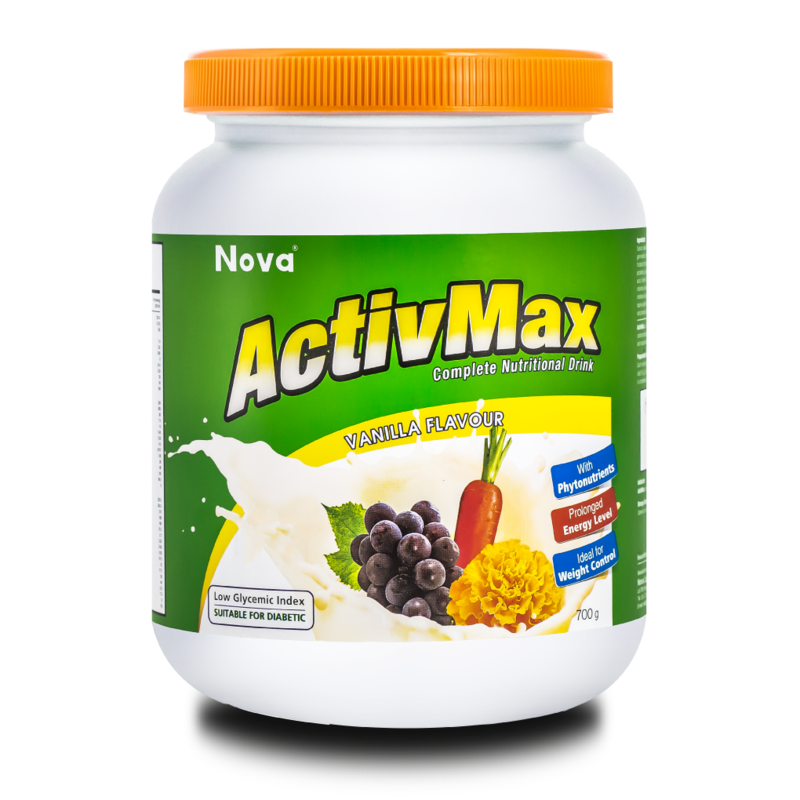 ActivMax Chocolate can be taken at any time of the day as a meal replacement for men and women above 12 years old. Opened bottles should be tightly closed and stored in a cool, dry place, but not refrigerated. Consume within 2 months of opening.